Your Gilded Age Greeting staff is here at your service. Gilded Age Greeting is accepting a limited number of custom work commissions including invitations, awards and of course greeting cards. Gilded Age Greetings also offers translation services. We will gladly work with you in your language of choice. At Gilded Age Greetings, we pride ourselves on the hand craftsmanship used in every Gilded Age Greeting. We do our best to represent each image as it will arrive, but there may be times when there are variations to color, texture, size or shape, among other variations. This is part of our handmade process and we consider these unique characteristics as part of the beauty of our line. Vellum: The beauty of vellum includes the warp of the skin, when receiving the hand applied ink and pigment. This is a natural part of the vellum product and considered a sign of authenticity of the material and process. 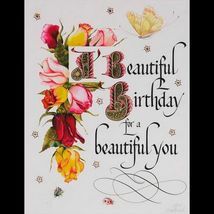 When making a purchase from Gilded Age Greetings you must accept these variations as part of our one of a kind work of art, each with its own subtle character. We cannot accept returns based on the above variations. Custom and or commissioned work may not be returned.